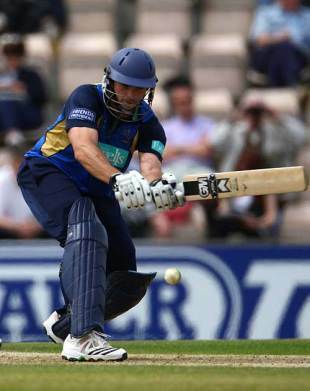 A powerful batting display from Hampshire, led by Michael Lumb's 100, propelled them into the Friends Provident Trophy semi-finals as they proved too good for a Middlesex team missing key players. Lumb and Jimmy Adams added an opening stand of 154, while there was a strong finish from Liam Dawson as Hampshire reached an imposing 310. The visitors' inexperience batting line-up couldn't keep up the chase. It was a commendable effort by Middlesex to hunt down a huge target without the services of Phil Hughes (back in Australia), Owais Shah and Eoin Morgan (both on England duty) after each of that trio had played key innings at various times in the qualifying stage. Without them, Middlesex had to draft in Billy Godleman, who had previously lost his one-day place, and 19-year-old Sam Robson. Godleman fell early in the chase, but Robson combined with Neil Dexter to give Middlesex a chance. They added 89 for the third wicket and kept the asking rate within reasonable bounds. However, Robson fell when he tried to cut Dawson and the middle order lost momentum. The normally free-flowing Dawid Malan laboured for 19 off 39 balls and three quick wickets then put paid to any slim hopes of success. Udal, the Middlesex captain, made a surprise move by opening the bowling on a dry surface after Hampshire batted first. However, that experiment lasted just one over before the quicks took over and the Hampshire openers began to make hay. The run rate was soon above a run-a-ball and the visitors missed the experience of Tim Murtagh. Steven Finn made the breakthrough when he bowled Adams but Hampshire eased past 200 as Lumb reached his century off 97 balls. However, when he was stumped next ball off Malan the pace slowed a little as Udal picked up two quick wickets. But there was a final flourish from the home side as Michael Carberry and Dawson added 90 for the fifth wicket. Dawson again caught the eye with 51 off 37 balls and it was an innings that proved vital.